Like many novels, Bujold's Beguilement is multi-layered. On one level, it is a fantasy novel where Lakewalkers patrollers protect the lands from malice. On another, it's a romance novel where the veteran patroller, Dag, and a runaway farm girl, Fawn Bluefield, meet under life-threatening circumstances and, as one might suspect, develop a mutual relationship which becomes romantic. There are other things going in Beguilement, such as the dichotomy between Lakewalkers and farmers, but, for purposes of this review, I'd like to focus on the fantasy and romance layers first. First, the fantasy: In this respect, Beguilement is good stuff. It takes place in an unnamed world where Lakewalkers, thought to have once been lords and known to be sorcerers, patrol the lands searching for signs of blight and its cause, malices. A malice is a concentration of energy, what Lakewalkers term 'ground', brought to life under mysterious and not fully understood circumstances. Malices are not good. They bring with them beguilement and death, draining the ground from other beings in order to evolve into increasingly more powerful beings. Worst of all, a malice doesn't understand death. This grants them a certain immortality. A sharing knife is a special Lakewalker weapon that, when used on a malice, 'shares' a death with the creature. This act of sharing is the only way to kill a malice. As much as the book's title denotes one of the principal powers of a malice, it also refers to the effect Dag and Fawn have on one another. Herein enters the romance. Dag is a dry-witted Lakewalker, a veteran with over twenty malice kills and a reputation as a capable, resourceful patroller. 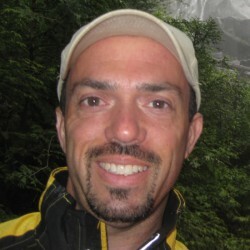 He has tragedy in his makeup, which I won't say necessarily haunts him, but certainly fills him with a sense of regret. It is this regret which increasingly weighs heavy on him when, out on patrol, a new malice threat and a farmer girl named Fawn Bluefield enter his life. I won't ruin anything about the encounter with the malice, only that both Dag and Fawn survive and go on to become lovers. It's an odd relationship: by custom, Lakewalkers and farmers do not interrelate in such ways. They take this 'forbidden love' back to Fawn's home where much drama ensues between herself, her family, and Dag. That, in a nutshell, is what Beguilement is about. The story has points of slowness, but I never felt like it bogged down. The writing is excellent and tight; while there are other sub-plots intertwined with the main ones, none of them were a distraction. If anything, exactly the opposite: there's plenty of character-building here, and the characters are grounded, believable, and exceptionally thought-out. Fawn, despite entering the story as a runaway farm girl (which seemed a bit of a stereotype), soon shows us she is much more. Dag, for his part, plays the role of veteran soldier-sorcerer well; it's what lies beneath that draws the reader in and allows us to sympathize with his past and what he hopes for his future. I found Bujold's system of magic and such concepts as the sharing knife to be original and intriguing. In many ways, it was this intrigue which kept me reading and wanting to know more. One warning: Bujold leaps from one book to another with nary a break in the story. I imagine her having written all four books at one time (is there a fifth still to come? ), then the publisher coming along later and slicing it into the four books we currently have. This probably isn't the case, but that's how one might look at it. With that in mind, if you read Beguilement, you'll at least want to pick up Legacy, because it picks up right where book one left off and goes a long way towards concluding the storyline begun in book one. 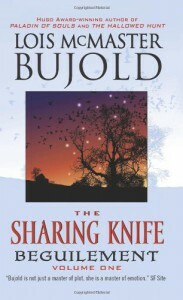 I think Bujold delivers with Beguilement and the larger The Sharing Knife series as a whole. Superb writing, well-grounded characters, and a colorful world and intriguing magic system all come together to form an entertaining, engaging read.